With grant support from the Real Estate Foundation of BC, we’ve launched a unique and innovative project to develop a Mobility Advocacy Plan (MAP Strathcona) for our business district – the first of its kind in Canada. The purpose of this project is to develop a community-based mobility and transportation vision and supporting action plan for the SBIA and project partners to pursue. The project will explore a range of transportation and mobility issues, including goods movement, transit, curbside uses, active transportation, car and bike sharing opportunities, and parking. The planning process will also help educate SBIA members about the transportation impacts of upcoming changes in and around Stathcona, like the Georgia/Dunsmuir viaducts removal, Centerm expansion, new residential/commercial developments, and numerous City of Vancouver plans that will impact our area. 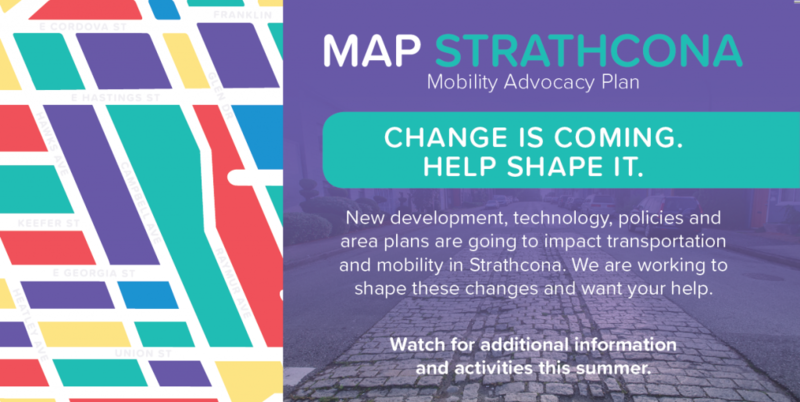 What are the most pressing transportation and mobility issues and opportunities in Strathcona from your perspective? Fill out this short survey to help us know where to focus our efforts. Join us for a action-oriented breakfast meeting with SBIA members and key transportation stakeholders (City of Vancouver, Translink, Metro Vancouver, Modo and others), as we explore future transportation and mobility scenarios for Strathcona, identify a preferred vision, and outline the actions partners and stakeholders will need to undertake to achieve it. Breakfast and coffee will be provided! Register for the event here. Ride with us on a bike-along workshop to assess cycling needs and opportunities in the neighbourhood with a post-ride debrief at a local brewery – date in September, to be announced soon. Does your business experience issues related to goods movement? Do you own your own fleet or experience a high volume of shipments and deliveries? We want to ride along to hear and experience your concerns. We’ve put together a summary of all the upcoming transportation changes in our neighbourhood that could impact your business – from the Viaducts removal to HOV lane changes on Hastings. Read the Project Backgrounder here.